There is something grand about this time of year:) Winter is fading and summer is approaching. The birds are out in fine form and the flowers are blooming. But best of all the school holidays are about to start. 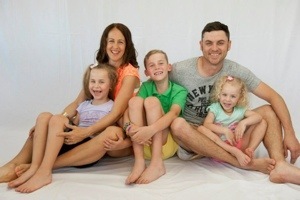 For me the spring school holidays are my favourite. Between Christmas, Easter and Sienna’s birthday all involved with the other school holidays, it leaves September holidays to chill, potter and give the house a good spring clean! I sat down today to write my ‘to do list’ for the holidays. I’m a list kind of gal and can not function without one. Not only does it leave my mind feeling scattered without one, I simply forget to do things if it’s not written down somewhere! After writing my list the feeling of loving these holidays to chill out was overcome with disappointment, but I’m not going to let this list consume my holidays! I plan on doing something from my list each day and will not stress if at the end of the holidays things are left uncrossed! They will simply be done as soon as I’m able to get to it! 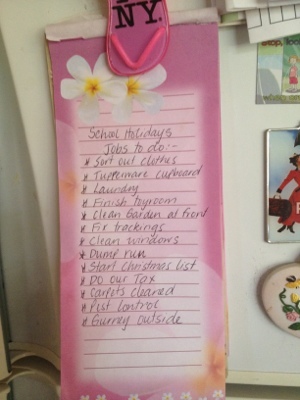 This list is a ‘to do list’ for the September school holidays, but the things included on the list are things I want done before the festive season begins. Running a household is a full-time job in itself. I admire full-time working mums as working two days a week I find it hard to fit in doing those odd jobs that need to be done, but are often pushed aside so the necessities are done! It’s been a while since I wrote a list of jobs to be done around the house, but it’s time to get serious and finish things off that need to be cleaned out and sorted! We’ve been in our house for 10 years at the end of the year and I’m determined to have it to a point where we can sit back and be proud of what we have achieved! I’m happy to say I have started doing one of the jobs from my list today:) I’ll keep you posted at the end of the holidays how successful I was! Who else is a list kind of gal or guy?